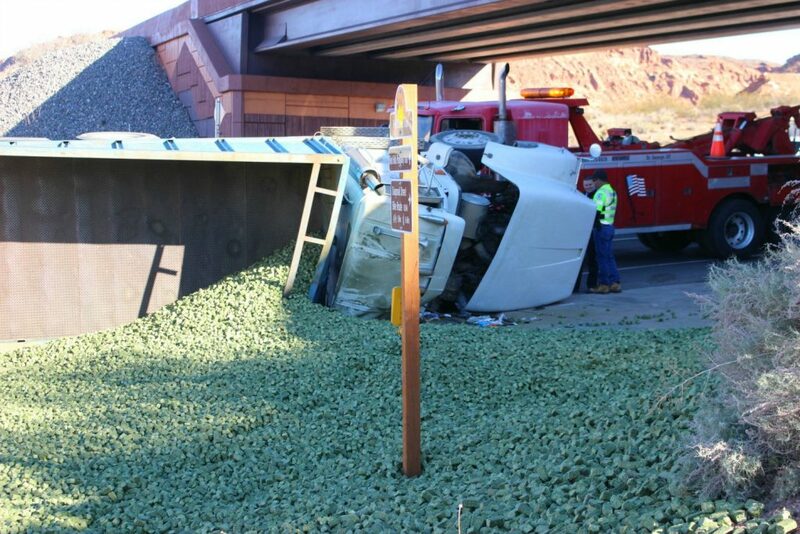 ST. GEORGE — A large dump truck hauling thousands of pounds of alfalfa pellets tipped over while turning in an intersection, sending feed spilling across the roadway Saturday morning. 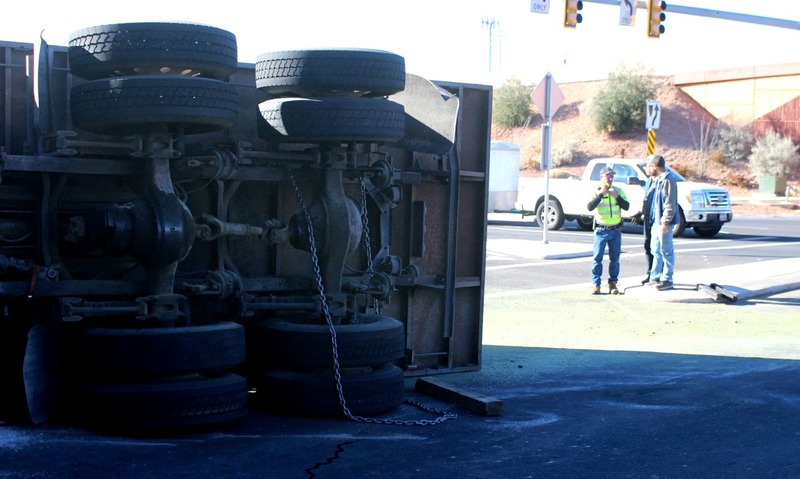 Shortly before 9:30 a.m. emergency personnel were dispatched to the rollover on Red Hills Parkway at the Bluff Street-Snow Canyon Parkway intersection, St. George Police officer Trevor Anderson said. 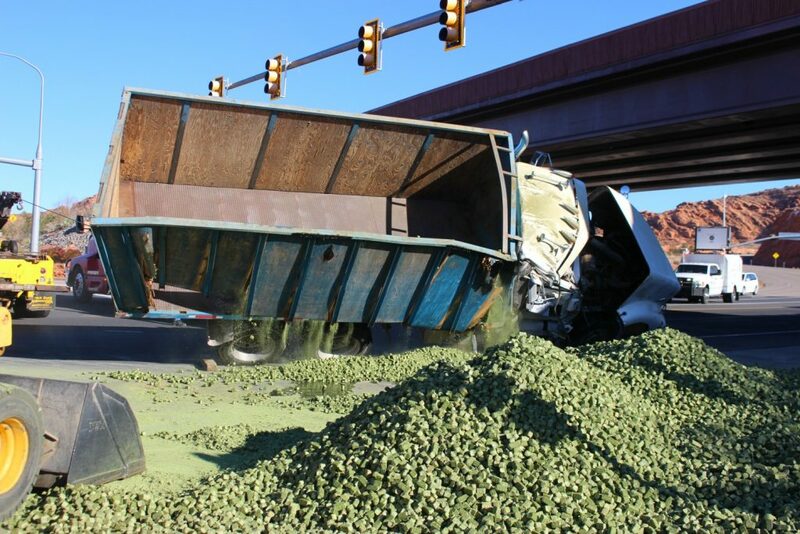 Upon arrival, officers found the dump truck on its side blocking both eastbound lanes of Snow Canyon Parkway with more than 24,000 pounds of alfalfa pellets spilled across the road and piled on the embankment just south of the intersection. Officers closed multiple lanes initially and began directing traffic away from the intersection. The truck continued just as the traffic light turned yellow, and the driver told police that “he lost brake pressure” as he started a left turn to head east on Red Hills Parkway. 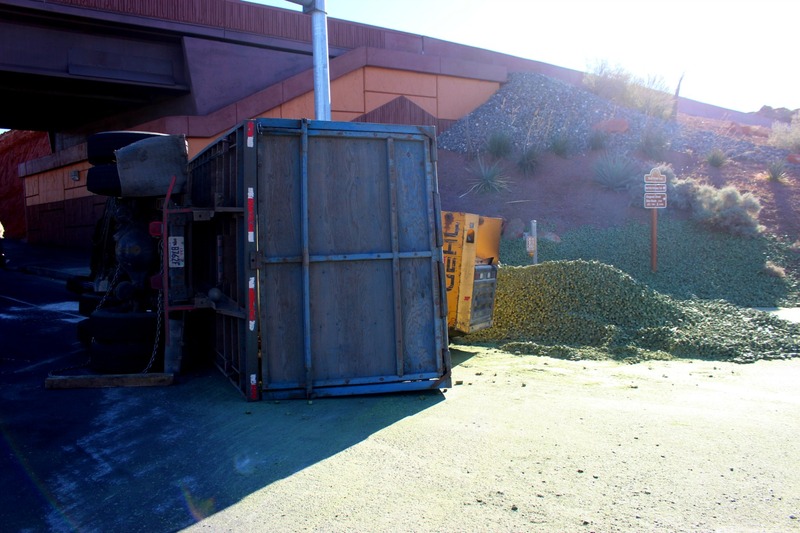 “The light was yellow as he was coming down the hill, and he said the brake issue prevented him from slowing the truck down,” Anderson said. Instead, the truck continued through the light and was traveling approximately 35 mph when it turned, causing the truck to tip over onto its side. “It just came through the intersection too fast,” Anderson said, noting that the incident was still under investigation and any citation was still pending. The driver was able to crawl out of the overturned cab on his own and call for help. 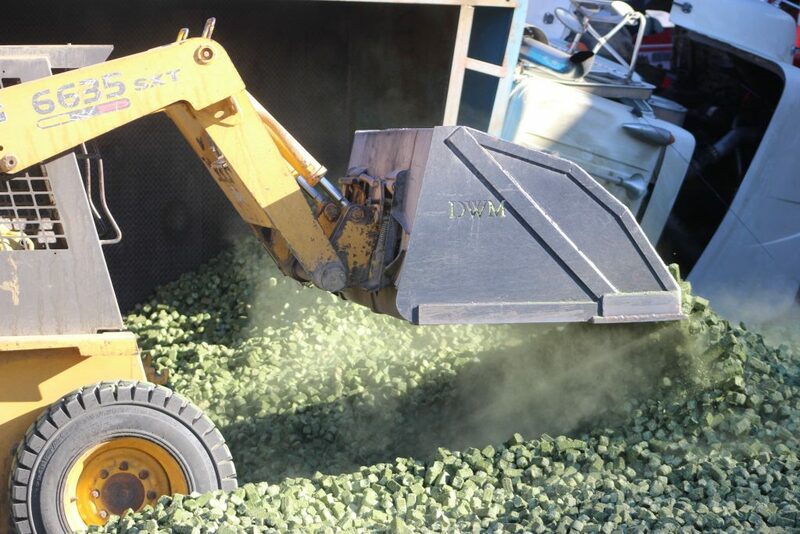 A skid-steer loader arrived to unload the remaining pellets from the overturned truck and load them into a second truck sent by the feed company. Both eastbound lanes of Snow Canyon Parkway remained closed during the cleanup effort. Once the wrecker arrived, the truck was pulled to an upright position and towed from the roadway. 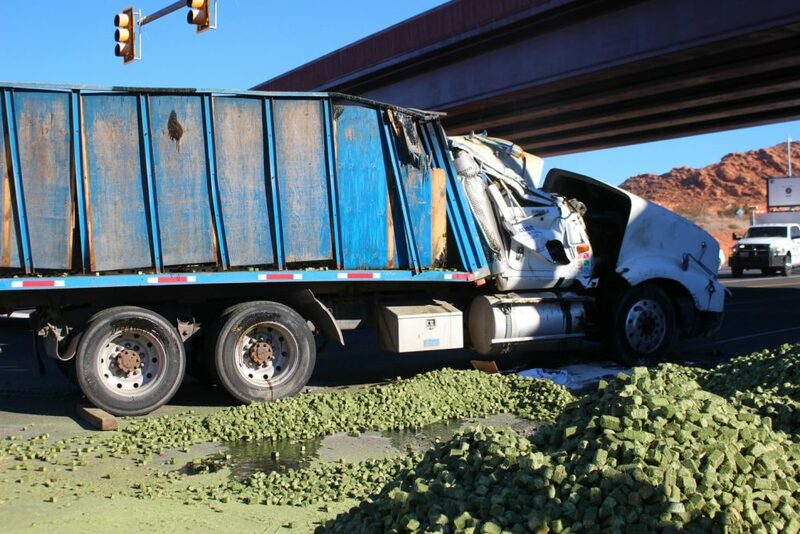 Utah Department of Transportation’s Incident Management Team responded to assist with the cleanup, and the roadway was reopened at shortly after noon. The St. George Police Department responded with multiple officers, assisted by personnel from the St. George Fire Department. Another rollover at that convoluted mess of an intersection. It is without question one of the most poorly conceived ideas I’ve ever seen when it comes to road design and, to the uninitiated, a confusing maze. The lines on the road alone look like someone tossed a bunch of broken pickup sticks on the ground and arranged them into some sort of curves going in all directions. And I thought that diamond interchange over the I-15 was nuts. This place takes the cake. I was confused for over a minute then finally I got it. Good one El Trav. I don’t get it. A reference to a movie I haven’t seen or something?…. Our Gang. 1930s kid show. Dont forget Froggy !!!! And have to mention there’s a local dog at Mathis Park that is an apparent clone of Spankys dog. Dont eat the coleslaw!!!! Could be spiked with hot sauce!!!! I think youre referring to the Bluff Sunset intersection frozen vegie. The intersection where this accident occurred is where you get onto Red Cliffs drive if you go straight from Snow Canyon.. It is actually very well designed. Going northbound on Bluff you even have the ability to bypass it entirely. On that note, as a former safety director in my mid to late 20s once upon a time, the driver should have done a brake inspection and if necessary made adjustments prior before hitting the road, but I would ignore that cause as secondary and a likely excuse. He simply was going to fast. You could argue there was a load shift or imbalance that further exacerbated losing control. This was a completely avoidable accident. If he doesn’t have company insurance and is self insured, then my guess he’s out of a career. Sad to say the insurance companies will not renew his cargo insurance policy let alone liability. Computer chair quarterbacking. How typical. I WAS referring to the very intersection where this happened, Mr. “Former” Saftey Director. Which is a glorified way of calling yourself a sign holder/flagman on a road construction crew. While you were directing traffic, I was the one running the heavy equipment building the roads. I have a pretty fair grasp of what good road building versus bad road building is. Seeing as I’ve actually built them before. Moral of the story : “SLOW DOWN ! DUH!” There is nothing wrong with the intersection! Agreed. It is one of the best designed traffic intersections in Washington County. Gee frozen veggie I have driven through that intersection hundreds of times, at least 3+ times a week for years. Guess that doesn’t count. As a GLORIOUS safety manager for 3 years I hired and road tested 300+ class A drivers. I guess it doesn’t count I also had to investigate and write detailed reports of 100s of accidents /incidents which were critical in negotiating insurance settlements and subsequent legal resolutions. I have personally been onsite for 100+ accidents and worked side by side with law enforcement to get to the bottom of the matter. Fatalities, hazardous spills, crane accidents in the port, hospital visits, legal depositions. Yeah it was glorious and sometimes horrific and sad. Bottomline, our opinions differ, and the cause of the accident was certainly not the intersection, that is a fact based on the info above. I think it is a well designed intersection, you dont. Ok, so what. Your non humorous personal attack is what is wrong with the comments section. My original comment was not an attack. Find that inner love Frozen Veggie, the stress is not good for you. Time to thaw and be a little nicer. See didn’t use the word troll, lol. The fact that you troll my comments tells me one simple truth. I live in your head, rent-free. As the frozen veggie quotes me once again.. Who is living in who’s head? hahahahaha! Give me a break Frozen Veggie, you can’t stop. LOL. This is just a comment section in the SG news. You act like it’s important or has any relevance when in fact most of the time it is a battle of meaningless words that no one cares about, but I do admit some of the humor is great. When it does matter is when there are real LOCAL or even Statewide issues and there is an exchange of ideas and information not mentioned in the article. It also serves as a public square for political / social venting – also a good thing from the standpoint of healthy catharsis. In the real world there is only meaning in a comment section such as this if people actually listen to the message. It was a beautiful afternoon in the Red Cliffs Desert tortoise reserve today and to be honest, for the several hours spent there not once did you enter my mind. Just saying, and once again being perfectly honest. No further comment. lol, kinda does sound like the iceplant got in your head? Why does the frozen veggie quote me all the time then? Who is in who’s head, BoB? This is the same exact place we had a massive milkshake a couple months ago. I’m hiding nearby, waiting for a big fat Wells Fargo Truck to take this corner at high speed as seems to be the pattern. The tall green in those pics got my attention!